Advancing gum disease leads to tooth loss due to the destruction of the gum and bone tissue that surrounds your teeth. 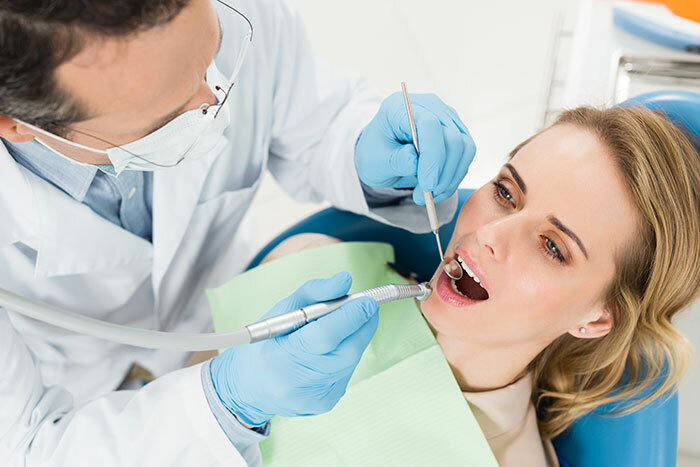 Factors causing periodontitis (gum disease) include genetics, smoking (tobacco use), poor dental care, poor oral hygiene, systemic diseases or conditions, medications, trauma, poor bite, malnutrition, and more. Remember the disease has no cure but through a solid commitment to treatment and care, the disease can be halted and managed for very long time. The sooner you seek care the more options will exist and the more tooth retention and better overall health we can achieve. Periodontal disease, also called gum disease, begins with bacterial growth in your mouth which is called gingivitis. If not properly treated, eventually becomes periodontitis. Advancing gum disease leads to tooth loss due to the destruction of the gum and bone tissue that surrounds your teeth. It is estimated that 75% of Americans have some form of gum disease, and many need to seek the care of a periodontist. Oral bacterial plaque is the primary cause of gum disease. However, other factors can contribute to periodontal disease. These include: family/genetic history, tobacco use, lapse in dental care/poor oral hygiene, weak immune systems, medications, poor bite, hormonal changes, personal stress, and much more. Medications can affect oral health because some lessen the flow of saliva and others decrease the immune systems natural defenses. Some drugs, such as the anticonvulsant medication Dilantin and the blood pressure drug Procardia and Adalat, can cause abnormal growth of gum tissue. Immunosuppressive medications used for autoimmune conditions such as various arthritic conditions and irritable bowl syndrome can allow the chronic bacterial dental plaque to fully infect the supportive tissue of the dentition. Bad habits such as smoking and smokeless tobacco use can severely deplete the gum and bone of needed oxygen, repair and defense cells. It also dramatically increases the risks of oral and throat cancers. Poor oral hygiene habits such as not brushing and flossing on a daily basis, make it easier for gingivitis to develop and lead to an overload that initiates full-blown gum disease (periodontitis). Family history of dental disease can be a contributing factor for the development of gum disease. If any immediate family members have had this or lost multiple teeth (having dental partials or dentures) it is very likely gum disease runs in your family. Gingivitis is the earliest stage of gum disease. It is caused when plaque builds up around the gum line which causes inflammation of the gums. If you neglect to or do not properly brush or floss your teeth daily, this plaque buildup will trap bacteria that cause gum disease. Gingivitis causes inflammation of the gums. Gums that should otherwise be pink and healthy will appear red and swollen and you may experience bleeding when you brush or floss. At this point, gingivitis can still be reversed. The bone and fibers that hold your teeth in place have not yet been affected. With proper oral care and regular visits to your dental provider, this condition can be managed and reversed. Periodontitis is a condition that results if gingivitis is left untreated. At this stage, the supporting bone and fibers that hold your teeth in place have been irreversibly damaged. Your gums will begin to form “pockets”, which are deep separations between the tooth and the gum that trap food, plaque, and bacteria. Your gums may begin to recede, forming gaps between your teeth. Immediate treatment is necessary to prevent further damage and tooth loss. Advanced Periodontitis is the final stage of gum disease when periodontitis has been left untreated. The aggressive bacteria grows, spreads, and causes destruction that destroys the connective tissues and bone that support the teeth. The pockets that formed in the previous stage are much deeper. This can cause your teeth to shift or loosen. Loose teeth that move around in the mouth may affect your bite and cosmetics. At this state, aggressive treatment is needed to save the teeth and arrest the destructive process. The office of Jason J. Augustine performs a wide range of non-surgical, laser assisted and surgical treatments of gum disease. Schedule a consultation with Dr. Augustine to determine what treatments are best for you.